She’d slit the throat of all Paree. – hear ‘em roar, hear ‘em roar! – hear how loud the cannons roar! He’d give his realm fidelity. We’ll give no quarter too! She fell flat on her face! But we’re the champions, every one. From your palace to the keep! She began to weep as well. All because she’d lost her crown! They’d gun down our comrades now. Our bullets make ‘em dance! No matter who comes here to fight. We’ll give ‘em such a scare! 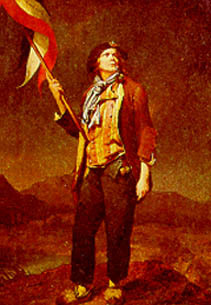 The Sans-Culottes from our town. The bells of freedom ring! * ‘Switzers’ here refers to Swiss mercenaries in the pay of the King of France. There are several variants of this song. The words have been translated very freely and are possibly more ‘jokey’ than the original. As with all the better-known songs of the French Revolutionary period, this is actually a very rousing piece of music. If you would like to sing along, you will find the tune here.